Here at Foundation Repair of Western Colorado, we specialize in solving a broad range of foundation problems. Have you noticed cracks in your foundation? Are your foundation walls bowing? Do you have water leaking into your basement through the foundation? The good news is foundation issues can be repaired, and we can help. We will find the source of your problem and provide you with a quality foundation repair solution. All of our proven solutions are customized for your home. As a Supportworks dealer in Colorado, we install Patented, Warrantied Products available nowhere else, and all of our foundation specialists are experienced and fully trained. Call us or click below to schedule an on-site inspection and estimate with one of our foundation repair experts. "Knew their job and always kept us informed." The crew was very professional and sensitive to my fears about the project. Very much appreciated all your hard work, the guys were great too! Your team definitely knew what they were doing. Well done, better than expected. Your team was experienced and knowledgeable. 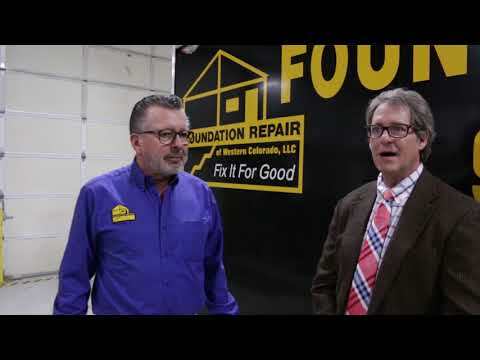 We have already recommended Foundation Repair of Western Colorado to others. It's really great how things worked out, I know I will be telling stories about how it all came together for years to come. Thanks Ted for being "The Man"! Click on any symptom to learn more about your specific foundation problem and how we can fix it. No two foundation problems are alike. We use only warrantied foundation repair products that have proven to be effective for repairing issues like cracks, sinking, bowing walls, and more. We ensure the best solution for your home's specific needs. Helical piers, push piers, concrete leveling and wall stabilization are just a few of our common solutions. You don't have to live with stressful foundation problems. Foundation Repair of Western Colorado is your expert foundation contractor in Colorado. We will conduct a thorough inspection of your home, and we'll let you know exactly what steps need to be taken to permanently stabilize your foundation -- restoring value to your greatest investment. Contact us today to request your N0-Obligation foundation repair estimate in Steamboat Springs, Austin, Carbondale, Glenwood Springs, Clifton, Craig, Delta or nearby.